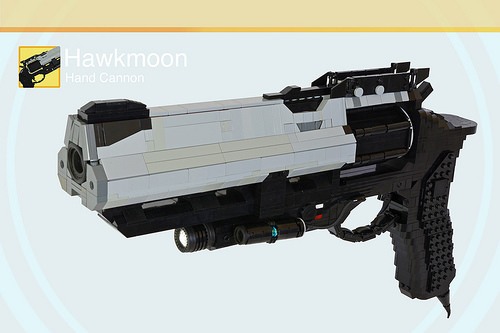 Following up his life size Mida Multi-Tool prop, Elliott Feldman presents to us his LEGO replica of the Exotic hand cannon Hawkmoon from Destiny: The Taken King. While his Hawkmoon appears larger than 1:1 scale, the details, angles, and elegance of the original weapon design are on point. I particularly like the construction of the cylinder and angles surrounding the barrel. Elliott demonstrates the working trigger and moving hammer, provides more insight into his build process, and shows side-by-side comparisons with his Hawkmoon and the in-game Hawkmoon in a short video posted on his YouTube channel.